For a limited time, folks who have been itching for a more portable data solution can pre-order the upcoming Karma Go LTE hotspot. 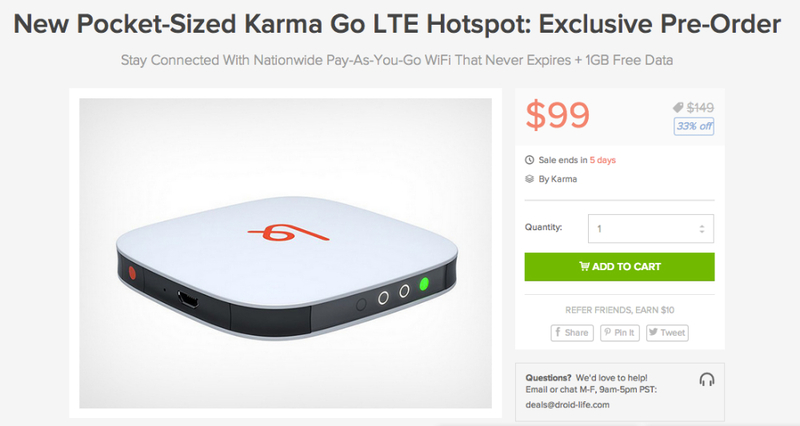 Set to be priced at $150, but available for $99 through a pre-order promotion, Karma Go allows users to pay for the data they use, sort of like a pay-as-you-go hotspot plan. Users pay a set price per GB of data they consume, with the hotspot itself feeding off an available LTE connection in the area. Should LTE not be available at the moment, the system falls back to a 3G CDMA connection. For a more detailed look at where connectivity is offered, please see here. With the hotspot itself connected to a network, up to 8 devices can feed from its connection, allowing you and all of your friends to get in on the action. For example, if you take a few clients out to lunch, but also need to make sure all of you can stay connected to the outside world, just bring your Karma Go with you. After paying the $99 to pre-order, Karma Go has no subscription fees, no contracts, and no hidden fees. The company seems quite adamant on making sure customers are completely aware of what they are buying, not to blindside them with additional costs down the road of ownership. If you are interested, take a peek at a few of its features down below, followed by a link to buy one for yourself. WiFi to share – Connect up to 8 devices at once, and earn 100MB of free data when you share your connection with others. Pay-as-you-go data – $9.90-$14/GB. No contracts. No subscriptions. No hidden fees. Lightweight & Compact – At 2.6″ wide, 2.6″ high, 0.5″ deep, and weighing in at 2.1 oz, Karma fits right into your pocket and is small enough to take with you everywhere you go.